Flush Designs: Winter wonderland with a little shabby chic... Save the Date. Winter wonderland with a little shabby chic... Save the Date. AS PROMISED!!! Some Paper products!!! I just finished designing this Save the Date for my dearest friend. Their wedding is going to be in December in the beautiful setting of Whistler British Columbia. She is a very elegant girl but wants a soft whimsical feel to her wedding, what better way to say soft and whimsical then with some stitching of course. 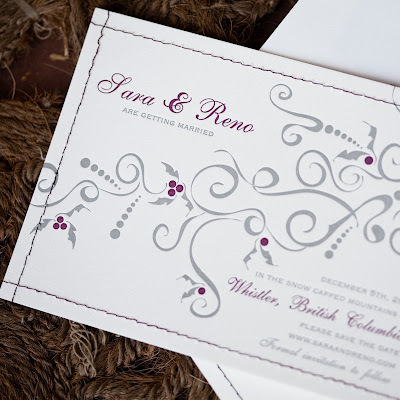 :) And how could I resist a little berry love for a winter december wedding! This is double sided with their monogram on the front and the save the date on the back.Her colors are Grey and Eggplant with of course some most beautiful lavender brought in later...Grey is the hottest color right now...so I just can't wait to see it all come together! 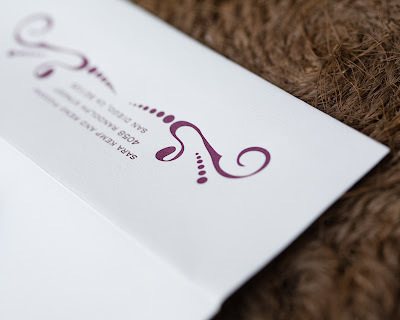 I am excited to start designing the invite! Being that the olympics are one month after her wedding I sure hope there is not a bunch of construction going on!! :) And of course Erin Hearts Court will be capturing her most beautiful day, which we are so excited to do! These beauties were printed by no other then the wonderful company Spark! 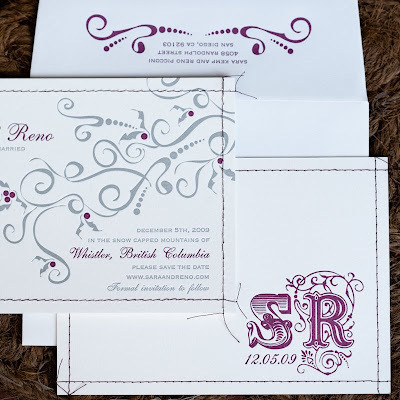 Ladies if you are a DIY bride and designed your invites yourself but want to have them lettterpress printed, Spark is the best, affordable and truely a pleasure to work with. OOps did I just promote DIY invites.... what am I doing to my business.... :) he he. Don't worry I still print on my own but some projects I like to send out. Oh they are fabulous. Will you be my friend!? Seriously! Love them. Absolutely gorgeous, Courtney! I can't wait to meet one of your closest friends. 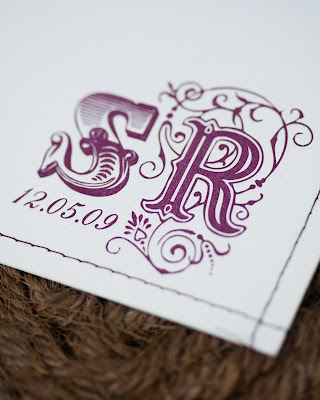 And what gorgeous wedding colours! A little Fire, A little deco, A lot of fun. Rustic Swank...Real Wedding in Palm springs!